Teach your child the stories of Enoch, Noah, and the tower of Babel with an easy to follow lesson guide. Descriptive story outlines will help you prepare for telling these important stories; while the practical applications sprinkled all over the narrative will help you draw important life lessons and relate them to your child’s life. 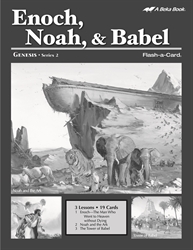 Paired with the flash-a-cards, the story of Enoch, Noah, and Babel can be one of your child’s favorite Bible stories.